A number of local legends surround Erokii and the Doomcrag, and these can be found in the tomes Dire Legends of the Doomcrag and Tears of Anurraame. 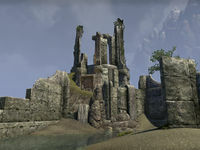 For game-specific information, see the ESO Erokii Ruins and Doomcrag articles. This page was last modified on 28 December 2017, at 09:42.